← If a conversation goes like this, what else can one say? Ok. Finally, here’s a post directly related to the tagline of this journal, Searching for Purpose! Yey! This programme aims to develop authentic purposeful and committed professionals who are ready to lead. Participants will learn to enhance their leadership competencies by developing self-awareness, personal mastery and professionalism.  To know the concept of Servant-leadership as it relates to Professionalism. my Current State: I am working in the same institution for the past 8 years, I am bored as hell. I am lost..There’s this tiny voice in my head that bugs me each and every day to go and explore other options.Yes. there are options, and all these options came at this time that I am feeling this…what a co-incidence…I thought…oh It’s a sign! I have to go..I just have to do it….until I attended this program! We started day one by making our own name cards by drawing our names and answering the questions (1) What gift am I? (2) My own personal goals for the sessions? I initially thought, o gosh, his questions are so hard but after few minutes of musing, I was able to think. I thought I’d draw a candle for my name which was supposed to mean hope (someone told me, my name means hope?) and I thought I have a gift of patience and my goal was just to take as much information and learn every new things that may come about the sessions. Tadah. Easy! Then he asked us to share all these information with a partner. I was like, what??? I don’t know these people. And to make matters worse, share within a small group, then walk around and share it with the entire class. What have I gotten myself into? An introvert, it was difficult for me. I was scared and shy but what the heck, never mind…after this, they wont remember me anyway…I shakingly completed these tasks. Then he asked us to form an airplane with our papers and let it fly many times then randomly take an airplane and read, he then asked us to share (or gossip) within a small group about another person’s paper. He asked us to formulate questions and discuss them within a small group again then write down on a flip chart. Questions I formulated? 2. Why do I have a feeling I need to be doing something else? What’s my real purpose? 3. How do I improve my leadership skills? 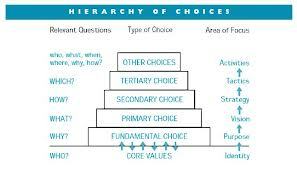 He then thought us about the concept introduced by Robert Fritz in his book “The Path of Least Resistance” , the Hierarchy of Choices, the chocolate cake. He said, normally, people makes choices under tertiary level but, fundamental levels usually are ignored, thus people would normally feel lost (exactly what I am feeling). It’s like when a building’s foundation is weak, it can easily collapse. He said, one must know the WHY of what one is doing. “Why am I doing this? Why am I here? And this fundamental choice is our PURPOSE. What is it? As usual, he asked us to share with the small group and the big group. After his activities, we all went for a buffet lunch. I was having a great time, I thanked my boss for sending me through SMS. After lunch, we were asked to pair up and do some story telling however, we’re supposed to share not just the usual stories. We should be able to share 8-10 stories or events that made us feel satisfied and happy. One partner just needs to listen while the other talks and the listener needs to write everything verbatim. I had a hard time to write because my partner talked so fast hence I guess I failed to inscribe it down word per word. He then asked us to highlight common themes while our partners helped us with writing the themes down into a clean paper. Together, we clustered the common themes together to narrow them down to single words. What surfaced in my story? The phrases “when I finish” “I am satisfied” “study” “perform””learn” “do something new””feel happy” etc.Then we narrowed it down to just 2 words; learning and expressing. We were asked to form a life purpose based on these words. Now I know how to formulate my very own personal purpose. I shall try doing this again by myself in a quieter environment and with longer time duration. To end the day, we formed a circle and he made us talk about our reflections by answering the following questions; (1)What might be some new discoveries for me today? (2) What else might I be curious about? 2. How am I going to start materializing on these despite discouragements and difficulties? Then we ended the day. This entry was posted in Uncategorized and tagged happy, interesting people, purpose, sign, trabaho. Bookmark the permalink.